A bunch of the OSSA gang went to the first vintage MX reunion at Unadilla. I was supporting Jim Foster on his Triumph Cubs. Alex, Warren, Johnny and Danny rode the cross country and motocross. Mick Andrews was in town riding a 500 BSA and Warren’s 74 Phantom! Karl Heise and I were spectating a race and he said: “Mike, we gotta build and moto crosser to get into this!” Well, things went back and forth for a year and we finally decided to use my 175 Phantom parts. Karl supplied a frame and forks, a tank, air cleaner housing and some odds and ends. I had the wheels and seat. Since this was going to be a “rider”, we got plastic fenders (originals are fiberglass) and alloy bars. We went with new tires and new amal carb. The bike is lightweight and looking good! 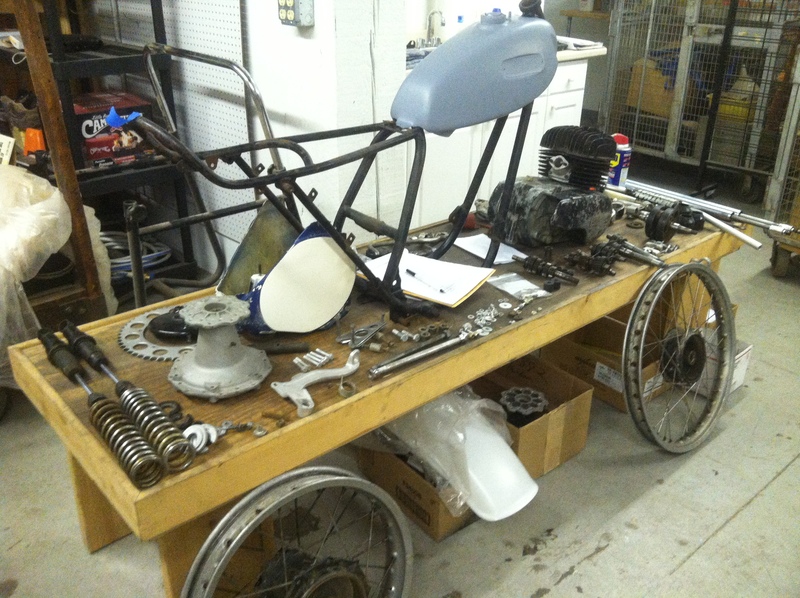 I’m working on the motor rebuild now – just got the crank back – hoping to have it ready for the 2015 season! These old bikes are most fun on the grass tracks such as the “Onion Farm” and Tom McKee’s in West Virginia. Unadilla will be more different, but how often does an amateur rider get to ride a world class GP track?